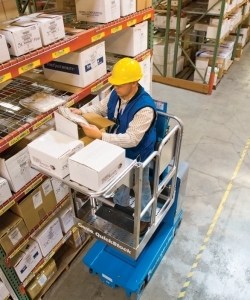 The Genie Quickstock (Genie QS) vertical mast lifts are compact, low weight machines, the ideal platform for order picking and a safer alternative to rolling stairs or ladders. 3 models with varying working heights, all with a zero inside turning radius, non-marking wheels, dual entry stock-picking platform and include a front load shelf and maintenance free batteries. The order picking machine is available in 2 versions, the Quickstock warehouse version and the retail version. The retail version has dual flashing beacons and an obstruction sensing pad on the top of the chassis, to prevent the platform from lowering if something has been placed on the chassis. 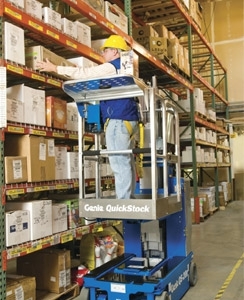 Genie QS12 is the smallest Quickstock lift in the range, with a working height of 5.45m, motion alarm, ideal for stock picking. 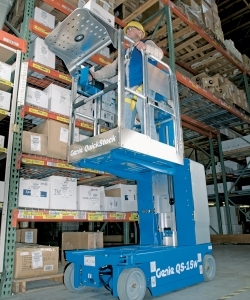 Genie QS15 A mid-size version of the quickstock lift, with a working height of 6.52m. Featuring a motion alarm sensor As with all Quickstock models it is available in either a Retail or Warehouse configuration. The largest model in the range with 0.80m width and a working height of 8.02m.